The Ottawa Rotary Home envisions a community that embraces the value of respite and residential services for individuals and families as part of a complete support network that promotes optimum health and well-being. The Ottawa Rotary Home exists to improve the quality of life of caregivers and individuals with disabilities through a family and person-centered approach that is responsive to individual needs and offered in a dynamic and flexible way. Family – The family unit is supported in knowing they are never alone in meeting the extra demands of caring for a child or adult with a disability. Empowerment – We encourage and foster the belief that each individual has the potential to grow and develop into his/her own unique person. 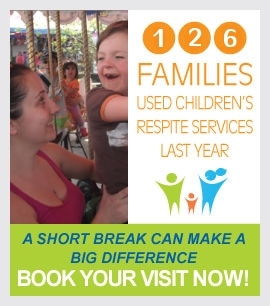 Community Awareness – We strive to increase community awareness and understanding of the value of respite services and specialized residential care to each individual that we encounter. Individuality – The unique needs of the family and individuals are the focus of planning and delivery of all supports and services. Quality – The Quality of life, service and living with respect and dignity. “Access-Ability” – We ensure that our environments are accessible to all individuals, given their abilities. Trust – The trust we develop with our families and individuals is integral to our organization. Our services are provided in a manner that is tailored to their strengths, needs and experiences. Passion & Compassion – Commitment to our work comes from within (energy, joy, playfulness) and flows out to benefit others.